Samuel S. Preble, one of the oldest members of the Odd Fellow and of the Grand Army in Massachusetts, and perhaps the oldest member of both organizations, died yesterday at his home, 53 Lincoln Avenue, Marblehead. He would have been 96 years old Dec. 18. He and his wife, on Aug. 2, celebrated their 74th wedding anniversary. His widow, who survives him, is 92. 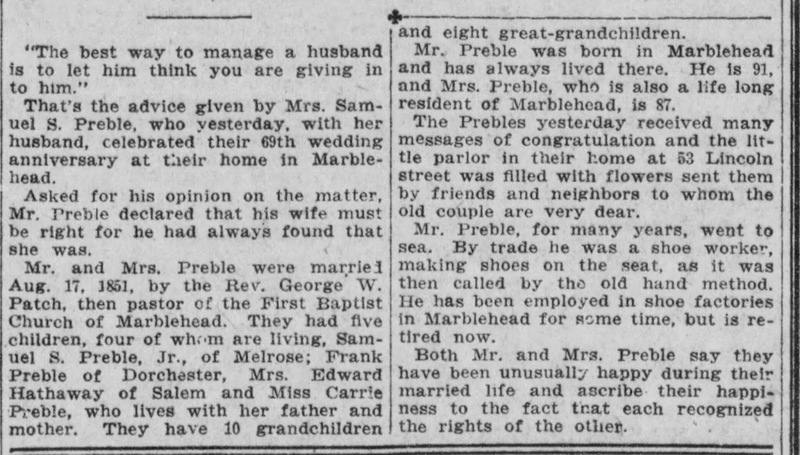 Mr. Preble was born in Marblehead. Early in his life, he went to the Grand Banks fishing. Later he became a shoe worker and for 50 years he worked in shoe factories in Lynn and Marblehead, retiring when he was 77. For 70 years, he had been a member of Atlantic Lodge, I.O.O.F., of Marblehead, and was the oldest member of that lodge. 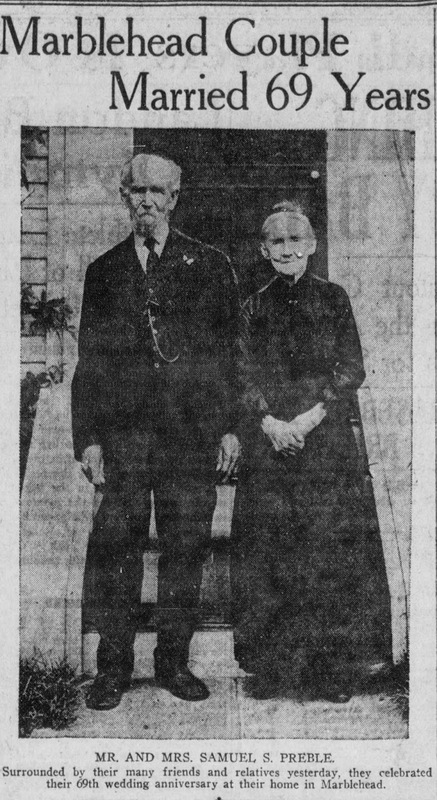 He also was the oldest member of John Goodwin, Jr., post, G.A.R., of Marblehead. When the civil war broke out, he enlisted in Company C, 8th Massachusetts Volunteers, serving nine months with that organization. Afterward, he served at Camp Newbern in South Carolina. For many years he was associated with bands. He played in the Salem brass band when the late T.S. Gilmore, noted bandmaster, was conductor. He was a church singer of local note in Marblehead and neighboring cities and towns. Besides his wife, he is survived by four sons and daughter, Samuel S. Preble, Jr. of Melrose; Frank A. and Carrie Preble of Marblehead, and Mrs. Edwin A. Hathaway of Swampscott. The funeral will be held tomorrow at 2 p.m. at his home. Burial will be in Waterside Cemetery.